In 1921 the Grain Silo Complex was constructed. For half a century, it was the tallest building in sub-Saharan Africa. Here, grain would be collected, graded, and then distributed. Ideally, it was designed to never go out of use, to never wear out, to always exist. Unfortunately in 2001 and after immediate years of plundering, it fell to disuse and was eventually ravaged by floods for years to come. In the following years, Duke Green, the CEO of the V&A Waterfront where the silo is located started to think of restoring the then abandoned complex. Initially, the district had planned to pull the building down and utilise the land for something else. Duke felt that the silo had so much soul to be pulled down, and instead started a search for the best architect and a sponsor to support his dream of restoration. Duke Green had been introduced to Thomas Heatherwick in 2004 by Design Indaba founder Ravi Naidoo. He would later settle on the Heatherwick Studio to design and repurpose the old building into the Zeitz Museum of Contemporary Art Africa (Zeitz MOCAA). In search of a place to display his private collection that he had been buying for 7 years at the time was John Zeitz, former CEO of Puma turned philanthropist. For him, it was a match made to be. Zeitz had been collecting African Art for several years since 2000. All the pieces were less than a decade old at the time. This would be Africa’s own version of the Tate Modern in London, designed by Herzog & de Meuron. It would be equivalent in stature to Renzo Piano’s Whitney Museum in New York. This would be Africa’s own contemporary art museum. The John Zeitz Foundation donated £30 million towards the project; not a huge number by worldwide standards, considering Tate cost £260 million, and Whitney £350 million. However, by African standards this figure was staggering. For one main reason so. In the USA and UK, art has by far catapulted itself from centuries of obliviousness to relevance. For decades leading to the millennium, art pieces would sell for millions of dollars. Today, they sell for hundreds of millions of dollars. The art industry is mature in these two countries as compared to Africa. In Africa this is the age of art uprising. Only recently in March 2011 did the continent sell its most expensive painting ever. The ‘Arab Priest’ by South African artist Irma Stern was sold at an auction to a museum in the Middle East for £3.1 million. Heatherwick would spend the next couple of years designing and figuring out how to repurpose the old silo into a post-industrial marvel. The client, John Zeitz, wanted something that would have the most significance. It would have to be delivered in form and aesthetics, as it would in the art to soon call this place home. Heatherwick took a grain of local corn that would have been stored in this silo in years past and scanned it digitally to get its organic asymmetrical structure. The architect would then cut into 42 concrete tubes, to create an asymmetrical form; the defining factor of the museum. As Heatherwick moved into the core of the project, it became a destruction project. They would cut into the tubes more than constructing anything new. They would remove a lot of concrete and structure. It became clear that the structure would then be jeopardized. However, no one would hear of new beams to hold the structure together. The cutting into the silo’s concrete tubes took about 3 million work hours to complete. The structure was nearly a century old, and so the concrete was sitting in its most perfect hardened form. To reinforce the structure without adding beams and columns into the building, Heatherwick recommended an additional layer of concrete sleeving to give the tubes even more strength. After an insurmountable amount of work and dedication, a large artium was successfully created. The atrium is like the interior of an organism with voids and sharp angles that all culminate at the top of the atrium; it is a thing of architectural beauty. On the roof, 100 windows collected into one geodesic dome allow light into the space. For a staggering nine floors, the atrium is an effort worth its name in gold. The studio took a building of 42 concrete tubes, regular in structure, and cut out irregular forms to create an industrially beaming interior of bare concrete, voids, light, and dynamism. It is the same level of ingenuity and architectural fashion that we have come to expect from Thomas Heatherwick. 9,500 square metres of the space will house the museum spreading over nine floors high. Above the museum is a five star hotel, the most expensive in Africa, known as Silo. Diamond-like patterned windows grace its facade to create a playful exterior. The concrete in this project had magnolia paint, which was washed out to reveal the concrete it in all its bare glory. Instead of designing flat glass windows for the hotel above, the architect resorted to using bulging windows reflecting views from the surrounding. At night when the lights are on, the windows come together to create what the Complex Grain Silo was supposed to be in the first place aside from being, well, a silo. They create a beacon for incoming ships from the Atlantic Ocean. 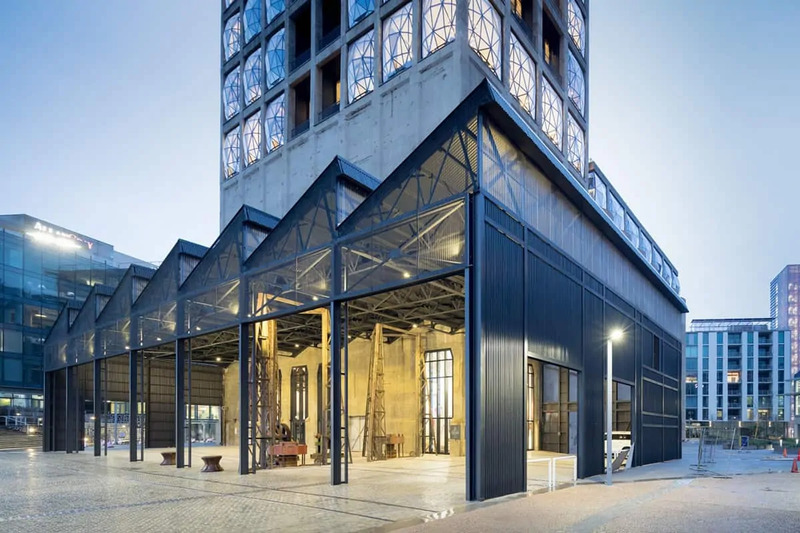 In addition to the exhibition space and the boutique hotel, the Zeitz MOCAA has a rooftop sculptural garden, art storage space, a bookshop, a restaurant, bar, reading rooms, and conservation areas. Spaces have also been provided for educational institutions including a costume institute. On some days, Africans from all walks of life can enter the museum free of charge. To enhance the public space, a pedestrian access and walkway into the town has been built. Bus stops for tourists and locals have also been integrated into the entry ways. John Zeitz wants all Africans to come here. Even more, he wants all African artists who had been displaying their art pieces abroad for lack of a better space to come back home. The Zeitz MOCAA overlooks the Robben Island in the distance. It provides amazing views from the Silo Hotel to the Table Mountains, Signal Hill, and Lion’s Head. From around it, views to the Atlantic Ocean have never been better. What fell into disuse in 2001 has now become a beacon of hope for the African artist. While these artists both in Africa and the diaspora have been painstakingly waiting for a place their art can call home, Duke Green, Thomas Heatherwick, and John Zeitz have been dreaming of something profound. In 2017, they delivered this gift to Africa. It is the world’s largest contemporary art museum dedicated to African art. It didn’t need to find another home, the silo didn’t need to disappear. It is all a work of restorative art. Right in the waterfront of Cape Town, South Africa, it sits at home; it sits best. And majestically so.